This is the Black Obelisk of Shalmaneser III of Assyria, in Room 6 of the Museum (more detailed description). It may bear the only extant depiction of an Israelite king, Jehu of the northern kingdom of Israel during the time of the divided kingdom described in I & II Kings. The obelisk shows someone in Israelite dress kneeling as he brings tribute. The inscription says it is the tribute of “Jehu son of Omri.” It does not say whether this is intended to be a depiction of Jehu himself, or of a messenger he sent with the tribute, so we do not know if this is actually Jehu. This is the interesting panel, as far as Biblical history is concerned. The kneeling figure is presenting Jehu’s tribute. Whether Jehu actually came with the tribute is unknown. This was the work of a sculptor back in Assyria who probably wasn’t even present, a sculptor who was more concerned with pleasing the king than he was with his portrayals of the other individuals on the monument. Shalmaneser III was not the Shalmaneser of the Bible (II Kings 17:3, 18:9). Shalmaneser V destroyed the northern kingdom (though he died sometime around the end of the siege of Samaria and Sargon II took the throne). Despite the inscription, Jehu (tenth king of the northern kingdom) was not really the son of Omri. He reigned during the time of Shalmaneser III, and ruled after the fall of the house of Omri. And that brings us to an item right behind the Black Obelisk in the British Museum. The Kurkh Stela, to the left here, pictures Shalmaneser III and celebrates victories at various battles, including the battle of Qarqar (perhaps the largest battle in history up to that time). One combatant named on the stone is Ahab of Israel (who WAS the son of Omri). Another is identified as Hadadezer of Damascus (Syria), the king elsewhere known (including in the Bible) as Benhadad II. If this begins to read like a Who’s Who of Biblical history during the time of the Divided Kingdom (or at least of the northern kingdom), then maybe we should pop across the Channel to Paris and visit the Louvre. 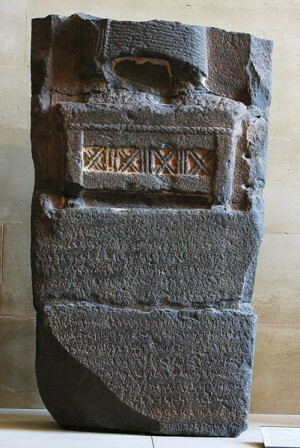 This is the Moabite Stone (or Mesha Stele) in the Louvre. King David of Israel conquered Moab, but it regained its independence when the kingdom divided. On this stele, Mesha, king of Moab, says his country was conquered and oppressed by Omri, king of Israel, and his son (presumably Ahab, though he doesn’t name him). He claimed he had delivered his people by victory over Omri’s son, and thus Moab no longer paid tribute to Israel. The Bible tells a different story — the rebellion was against Omri’s grandson, Ahaziah, right after the death of Ahab (when Israel was weakened after battle against Syria). Ahaziah only reigned two years, and was replaced by his brother, Jehoram, who formed a coalition and invaded. Moab was badly defeated, but Israel, Judah, and Edom withdrew in horror after Mesha sacrificed his son to his god Chemosh (II Kings 3). 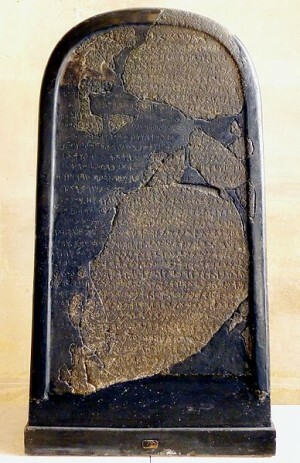 The Moabite Stone contains the earliest known reference (outside of Scripture, of course) to Jehovah, the God of Israel. Mesha couldn’t modify the Biblical record, but he could rewrite history for his people in Moab. It’s a long tradition — powerful people rewrite history to make themselves look better. Note: Sometimes people who aren’t powerful rewrite their own history to make themselves look better. Just as Mesha’s self-glorifying account is refuted by God’s records, ours will be, too, so we’d do well to avoid personal historical revisionism. Since we are in the Louvre anyway, this is the Zakkur Stele. Zakkur was a king of Hamath. Zakkur is not mentioned in the Bible, but II Kings 14 tells us Hamath (in Syria) was defeated in battle by Jeroboam II (the thirteenth king of the northern kingdom, and great-grandson of Jehu, mentioned above). On this monument Zakkur records that he was attacked by a coalition led by another familiar name to readers of the Old Testament — Barhadad (Benhadad) son of Hazael, king of Syria (Syria was also known as Aram and is so named on the stela). This is not Benhadad II who was the frequent rival (and occasional ally) of Ahab (I Kings 20 – II Kings 8), but Benhadad III, the enemy of Joash king of Israel, as described in II Kings 13:3, 24-25. I Kings 16:16-28 The Bible describes him as a military figure who had a rival in his first four years on the throne, yet grew strong enough in his relatively short reign to build a new capital city and to start a dynasty. The Moabite Stone says he was a conqueror. The Assyrians considered him important enough that even Jehu, who wasn’t descended from him, was called “son of Omri.” Both the Bible and external records say things about him that could only be true if he were a very strong king. The Bible says he was often involved in wars, and describes Moab as subject to Israel during his reign. The Kurkh Stela describes him as leading a strong military force, and the Moabite Stone describes Moab as being under Israelite oppression during the reign of Omri’s son (Ahab). I Kings 20, 22; II Kings 6-8 Israel needed divine help against him, so his army was obviously stronger, and he was strong enough to undertake multiple offensive campaigns against Israel. The Kurkh Stela has him as the leader of the coalition against the Assyrians, and the one among the coalition who had the largest force. I Kings describes peace for three years (finally broken by Ahab, I Kings 22). The Kurkh Stela records the battle of Qarqar (853 BC) and Ahab ended the peace (and died) around 850 BC. The monument says Benhadad and Ahab were allies, as described in Scripture, in a time frame fitting the Scripture record. Mesha of Moab (Moabite Stone) BC 849 II Kings 3 The Bible says Mesha is the king of Moab who rebelled against Israel after Ahab’s death. The Moabite Stone confirms this, even if it puts Mesha’s propaganda spin on events. The length of his reign is unknown — I’ve given the approximate date of his rebellion. II Kings 3, 6-9 The son of Ahab was weaker than his father, perhaps due to losses at Ramothgilead (I Kings 22) or to the short and weak reign of his brother (II Kings 1). In II Kings 3, after counting his soldiers, he decided to ask for help from Judah and Edom. The Moabite Stone lets us know Mesha was encouraged to rebel, and eventually succeeded in escaping Israel’s dominion. It doesn’t name Jehoram other than as the “son of Omri.” He was actually the grandson of Omri. Benhadad III of Syria / Damascus (Zaccur Stele) reigned BC 796 to 792? II Kings 13 The Bible says he was the son of Hazael, as does the Zaccur Stele. The first two monuments above are Assyrian monuments. The Assyrian collection in the British Museum is fascinating. Due to their position as the great power near the land of Israel, and their invasions of both the northern and southern kingdoms, there are many intersections between the Assyrian monuments and the Biblical records. These monuments were all intended to honour the kings who had them inscribed, to make those kings look good. Now, there is no one left who cares about Shalmaneser III, or Mesha, or Zakkur, no one they need to impress any longer. They’ve gone on, and will face their final judgment before a Court that won’t be swayed by royal propaganda. And yet, their work lives on, serving another purpose, one they never intended. Their “royal proganda” now honours the King of Heaven, for it confirms the accuracy of His written Word. Two hundred years ago, people might have doubted whether there was any accuracy in the historical accounts of the kings of Israel — and some did doubt. That doubt today can be seen to be very foolish, for these are but a few of the historical records discovered in the last two centuries that match up very well with the Biblical account. People also doubt whether there is any accuracy in the historical accounts of the death, burial, and resurrection of the Lord Jesus. The day is coming when that will be seen to be very foolish, as well. This entry was posted in Bible in British Museum and tagged Biblical archaeology, Black Obelisk, Kurkh Stela, Moabite Stone, Zakkur Stele. Bookmark the permalink. Jon, just read the latest issue of BAR which discusses the Jehu obelisk. The writer suggests that the figure connected with Jehu is a tribute bearer, sort of a generic submissive representative of a groveling foreign king. They say this because the panel above the Jehu panel has a similar figure in the same position, dressed almost identically. Of interest, though, is comparing the two panels. Their is a symbol above both groveling figures, but the symbol is reversed. The kingdom represented in the upper panel is on the far east of the Assyrian empire, with Israel being on the far west. The symbolism appears to represent the rising and setting sun. The king of the eastern nation has a name Sua of Gilzanu which apparently is pronounced very similarly to Iaua (Assyrian for Jehu). So there is coordination between the two panels, basically boasting about the extent of the Assyrian empire. Of course, as you say, who cares about the ancient king anymore? God gets the glory in the end. I’ve read several sources which said the “Jehu” figure is in Israelite dress, and we know from some of the other monuments, etc, what Israelites wore. But the dress didn’t look particularly distinctive to me. I’ve let my BAR subscription lapse a while ago. They get some articles from the view that hardly anything in the Bible is actually historically accurate. Did you think this was one of them? Did you get the sense the author was perhaps leading somewhere skeptical? Or did you sense it really was pretty much honest and accurate? Well, you do have to read BAR very carefully as you know. Lots of liberal unbelief to wade through. In this particular article, the writer is comparing two “portraits” of Israelite kings. The first is this one of Jehu, which he says isn’t really Jehu but Jehu’s agent. That seems to be his main point. the figure in the other panel looks very similar – really both look to me sort of like peasants, no “royal” appearance at all. That’s probably on purpose, the Assyrians are dissing their lackeys while elevating themselves, after all. The rest of the article is about a few fragments of a painting on plaster from a site “just over the border of Judah in the Sinai” that is possibly meant to portray Joash (either of Judah or Israel, the article isn’t conclusive). I’d say that the article is mainly accurate, but there is the usual vocabulary one finds in BAR. I found the similarity between the names interesting. I’m not sure I’d put any credence at all in the similarity in appearances of the figures in the two panels. After all, the monument was in Nimrud in Northern Iraq. The artist probably did not see any of the events depicted. He didn’t watch a YouTube video to see what these people looked like. 🙂 He would have seen Israeli captives, so would have an idea what Israeli clothing would look like (or at least, as you noted, what an Israeli slave’s clothing would look like). So with both kneeling figures, he’d just carve them the way he normally carved kneeling figures. Of course, there may be more to it than that, and I know you are merely summarising it, but it’s hard for me to see how similarities in the appearance of the two figures means anything. Of course, whether it is really supposed to be Jehu or his agent doesn’t really matter. It’s just kind of interesting. And it is interesting that we get all these Assyrian monuments depicting their kings, but even in the northern kingdom, where idolatry was so rampant, we don’t find monuments depicting their kings. Perhaps the Second Commandment, though rejected in many ways, still had an influence. They didn’t have YouTube back then? I’m shocked! I did find it coincidental that you would talk about Jehu the day after I read the BAR article. It’s all very fascinating to me. I just learned that they couldn’t look up stuff on wikipedia back then, either. How did they survive? No wonder they had wars and stuff. Now that we are more modern and educated and better able to communicate with one another, we don’t have that kind of stuff anymore, right? I agree about it all being fascinating. I don’t think the “Jehu depiction” revolutionises our understanding of Scripture or changes my life, but it is just very, very interesting to see these things. Thanks Jon, the historical insight from extra-biblical sources can be quite interesting. I’m afraid if I ever visited England and London in particular, I would never leave the British Museum. I would become a permanent fixture as I wander about taking in all the history that is on display. The chart is very helpful to lay out the interconnectedness of secular and sacred history. There are a few other things to see in London. 🙂 But I could be persuaded to hit the Museum every time.